Your morning makeup routine doesn't need to be boring. That's why we partnered with Dolce&Gabbana Light Blue for luxurious ways to organize your vanity tray. Surrounding yourself with the things you love makes your space pretty. And a bright scent can transport you to somewhere other than your bathroom, like the crisp smell of sparkling Summer days and Sicilian citron notes of the Mediterranean. Bright-white bungalows against aqua-blue waters bring to mind clean lines and fresh flowers, which is the perfect inspiration for elevating your vanity tray. A clean, white tray really lets your items pop. After selecting the right piece, it's time to arrange your beauty essentials into a stunning display of products. When positioning, take these tips into consideration. Add fresh flowers: There's nothing more luxurious than a bud vase filled with fresh flowers. And it adds such a pretty touch to your products. It's an indulgence you deserve, so head to the flower mart and pick up white flowers that play off the vanity tray. Use metallic accents: Gold, silver, and bronze are sparkling additions to your vanity area, so select a few choice jewelry baubles to position around your everyday items. Along with reminding you to don something pretty before heading out the door, it adds to the display. Show off the good stuff: Go through your items and only display products you really use — and find appealing. No one likes looking at dusty perfume bottles, so take the time to wipe items clean and feature your most favorite front and center. Feature scents you love, keepsakes, and mementos alongside essentials. Add linens: Make your countertop look like a five-star Mediterranean hotel and add a few luxury linens. A hand towel or washcloth at the base of your vanity tray creates texture and adds a pop of color. Pick up pretty containers: Pick up glass jars or sparkling metal cups to disguise your everyday items like bobby pins or cotton swabs. They add shimmer while upscaling your vanity area. Indulge! : While arranging your vanity tray, indulge your senses and don't be afraid to showcase the items you really love. You're going to wake up to the area every morning, which makes this the opportunity to let yourself feel completely pampered in your own bathroom. 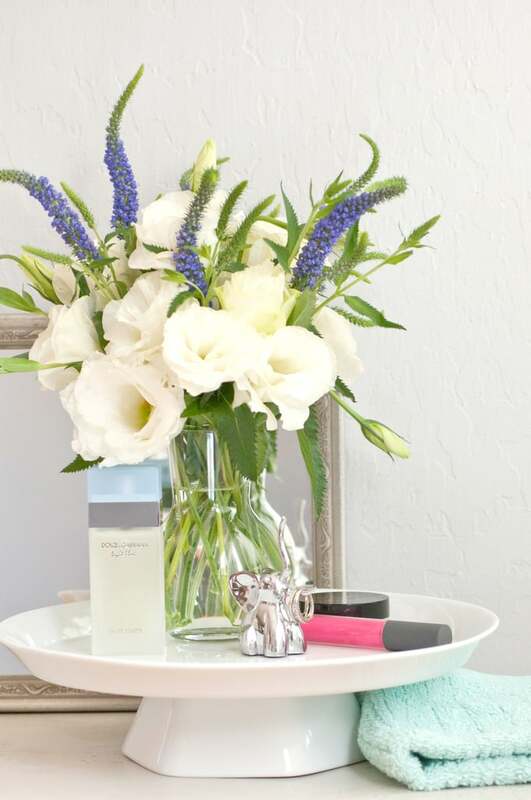 Once your vanity tray is all set, take a picture of it to save for showcasing how beautiful it looks. And it's a great reminder to keep the area looking lavish. Discover Dolce&Gabbana Light Blue at Sephora, and start creating your own Mediterranean-inspired oasis.